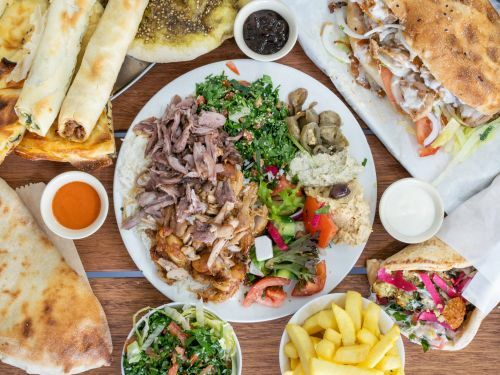 Menulog delivers for 5 Sisters Mediterranean Kitchen so you'll be able to track your courier on a map. Hot pita wrap with chips inside, garlic and tabouli. Marinated lamb with lettuce, tomato, onion and tzatziki. Marinated chicken fillet with lettuce, tomato, onion and tzatziki. With lettuce, tomato, onion and tzatziki. Any choice of kebab with chips and drink. Meat pack is only meat in a tray and nothing else. Three falafels, hummus, chips, tzatziki, Greek salad and Turkish bread. Lamb or chicken from the spit, Greek salad, tzatziki and Turkish bread. Lamb or chicken, rice, Greek salad, tabouli salad, hummus, tzatziki and Turkish bread. Kebab meat over chips with cheese and choice of sauces. Comes with a free can drink. Mixed chicken and Lamb from the spit, two dips, two salads, chips, six falafels and Turkish bread. Fresh chilli, onion and tomato. Egg, flour, zucchini and carrot. Homemade sweet filo pastry layered with cashews and sugar syrup. It comes with fives pieces of turkish delight.